If you run a local, brick-and-mortar business or would simply like to bring geographically targeted traffic to your website, local SEO services might just be right for you. Although you might have heard of search engine optimization, you might not know much about local SEO services. You would be surprised to find out that this form of optimization could be the perfect choice for your website. With traditional search engine optimization, websites are promoted to users from all over the country or world. This isn't the case with local SEO. Instead, your website is being promoted to focus on bringing in targeted traffic from people who live in your city or town. Local SEO has a lot of benefits, particularly for those who have websites or businesses that are best used by people who live near them. First of all, you do not have to worry much about competition because you are only competing with websites from one area as opposed to the entire world. Secondly, you also do not have to worry about dealing with traffic that will never convert into legitimate leads. Instead, many of the people who stumble across your site through local search engines will be from your local area and are more susceptible to purchasing what you have to offer. 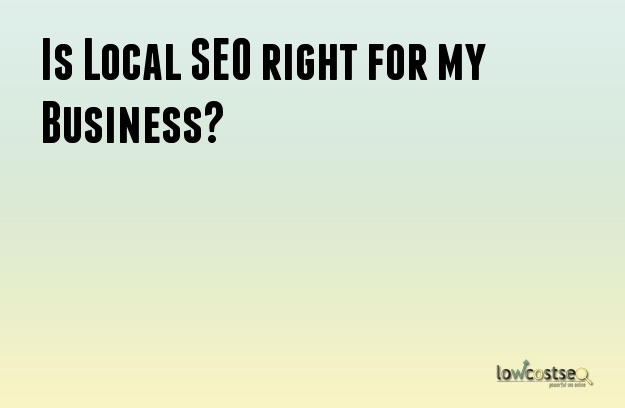 Do You Need Local SEO Services? If you run a restaurant or a clinic, there is really no point in focusing on bringing in traffic from the other side of the country. Instead, you should focus on letting people who live in your vicinity know about the things that you have to offer. Similarly, if you operate a local news website, business directory or other sites for people in one specific location, this type of optimization could be ideal. It is also a good idea to consider local SEO if your site is in a highly competitive niche. For example, it can be difficult to rank high for keywords such as "making money online" or "losing weight," but it might be a bit easier to do so if you choose a keyword that is related to your local area. Using local slangs can also help you to connect with your customers better. There are a few things that differ between local SEO and more traditional methods. First of all, your keywords will typically include the name of your city, town or state. Secondly, your SEO professional will focus on making sure that your site shows up on Google Maps, business directories and more for your area. This will make your site and business even easier for people to find. Local SEO services are essential for businesses or websites that are not positioned to go global. From training staff to correspond in foreign languages to indigenizing your website, these efforts can exhaust your company’s resources unnecessarily. Before formulating a marketing plan for your website, it is imperative to evaluate your company’s goals and define your target market. Local SEO services enable you to achieve your marketing objectives while staying within your budget. If you happen to work in the SEO industry, chances are there you have worked on Local SEO. Local SEO as the name suggest, involves making a website rank high in local search terms. For example, if you are doing SEO for a brick and mortar store, you need to make sure the official website of that business gets visible whenever people are searching with a combination of search term plus the name of the locality. Say, for example, you are doing Local SEO for a medicine store in New York City. So, your objective as an SEO professional is to make the website visible whenever people are searching with terms like – medicine store in New York City or Medicine Store NYC. As traditional SEO is getting difficult with each passing day and as Google is pounding all traditional SEO practices with relentless barrages of updates, more and more business organizations are opting for Local SEO because in most cases, it offer a solid online foundation besides offering an immense growth opportunity. What is all the more interesting about Local SEO is the fact that Local SEO is less competitive and the chance of ranking high is comparatively higher. Moreover, it is easier as well because you will be fighting it out with long tail keywords. There is another additional benefit of Local SEO you can hardly ignore - only businesses with real physical location can compete in this sphere. Therefore, gaming this system by getting involved in some unethical practices is tough to achieve, and probably this is the reason why more and more people are getting interested in Local SEO. Create Local Page – Unless you create local business pages for your business in leading search engines, you will never be able to rank. Start with Bing, then Yahoo and lastly Google. Make sure you have got registered with them and wait until you get verified by them all. It will take some time. Fill out Details Correctly – Take your time to fill out all the details. Make sure you are describing the business in simple English and use keywords without making it look like a spam. Choose proper category and the Title of the page should contain your business brand name along with locality if possible. Be Consistent – You should be using the same business information and address for all the local listing. If search engines find different description and different address for the same business, they might get confused and the ranking of your page might suffer. Ask for Review – You should always be asking your customers to leave a feedback on any of these Local listing websites. The higher the number of favorable feedbacks, the greater is the possibility of ranking high on targeted keywords. Great Quality Photos – You need to upload great quality photos of your actual business. When people search for local businesses, they want to see how the business looks like in real life and therefore, it is of vital importance that you are attaching high quality photos in all local listing websites.